DMI (also known as direction movement index) is a valuable tool for assessing price direction and strength. It is composed of two indicators, the positive directional indicator (+DMI) and the negative directional indicator (-DMI). Developed by J Welles Wilder in 1978. 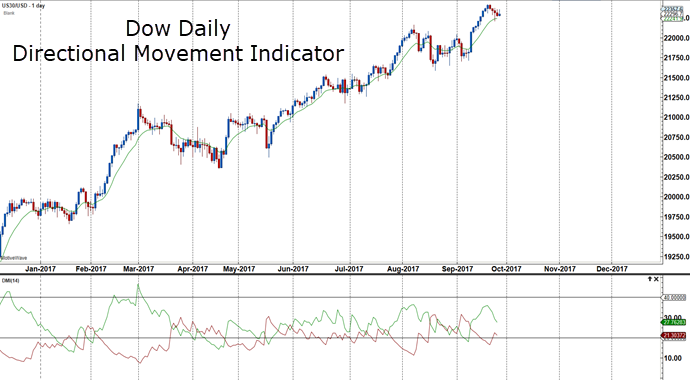 The Directional Movement Indicator (DMI) is a well-known indicator to assess market direction and trend strength. DMI shows whether the trend is up or down and is strong or weak. This is a good indicator for those traders who want to assess strong trends and enter only when these trends are strong. Just like other indicators, DMI can be applied to any market and time frame. DMI is a moving average of range expansion over 14 periods (default). The green +DMI measures the strength of uptrends and the red -DMI measures the strength of downtrends. When the green line is above the red line, it is dominant, and the trend is up. When the red line is above the green line, it is dominant and the trend is down. Traders look for crossovers and can use a crossover as a signal to enter long or short. However, using the crossover as a system can yield false trades so it is better to have direction in mind and use it to trigger a directional trade. For example, in the Dow Daily chart above, the Dow is in a strong uptrend. For the most part the green +DMI is above the red -DMI but there are false bearish signals with the red line crossing above the green line. Rather than sell this bullish market when the red crosses above the green, one can use it as a signal to buy when the green crosses back above the red line. Another way of putting this, is when the red line crosses above the green line, the market is retracing or correcting the bullish move. The +DMI is usually in sync with the price moving higher; as price progresses up, so does the +DMI line. When price corrects, so does the +DMI line. It crosses down through the -DMI line when the correction is steeper than normal sideways corrections in an uptrend. When the -DMI or red line is above the green line, price is falling in a downtrend, so red above green means down and green above red means up. In the 4-hour DOW chart below, notice the blue horizontal lines highlighting the crossovers. Also, notice the sideways price action where the crossovers occur. It isn’t until the trend resumes again that the distance between the green and red lines are separating nicely, indicating a strong trend. In fact, the higher the DMI value, the stronger the trend. DMI ranges from 0 to 100. A DMI above 25 means the direction is strong and below 25, weak. Trend identification – Identify the trend and use the DMI to follow the trend when the green line is above the red line for an uptrend or the red line is above the green line for a downtrend. For example, in the 4-hour Dow chart below, red is above green in two areas during corrections to the downside, and the strong trend emerges as the green crosses above the red and moves quickly above 25. Trend continuation – In a strong uptrend, use the DMI to buy into the trend when the green crosses back above the red in an uptrend. In the chart below, take only long trades when the DMI green crosses back above the red line. Note that a strong uptrend will show a series of rising peaks in the green line with the green line staying above the red line for long periods. Sideways markets – During sideways markets, both DMI lines will crisscross under the 25 level and that is the time to pause and wait for the trend to reemerge. The DMI lines will eventually expand above 25 as price takes flight again. 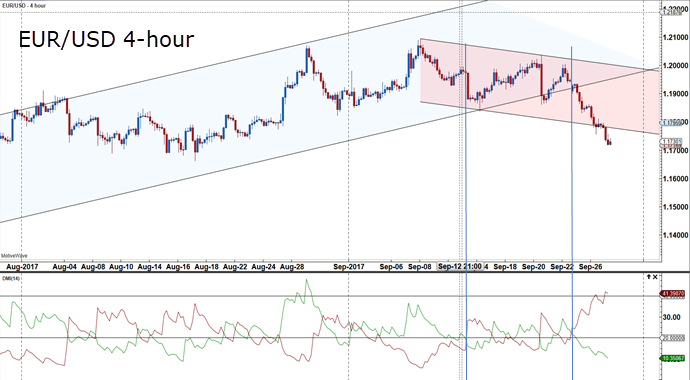 In the EUR/USD 4-Hour chart below, a buy opportunity exists when the DMI green crosses above the red and shoots above the 25 level, with price trading up over 100 pips to the upper channel line. Also, when price breaks down below the channel line, that is when the red DMI line crosses above the green DMI line, confirming a change in trend. This brings up a good point, which is to continue to use trend lines and channel lines, as well as support and resistance, when trading with the DMI indicator. 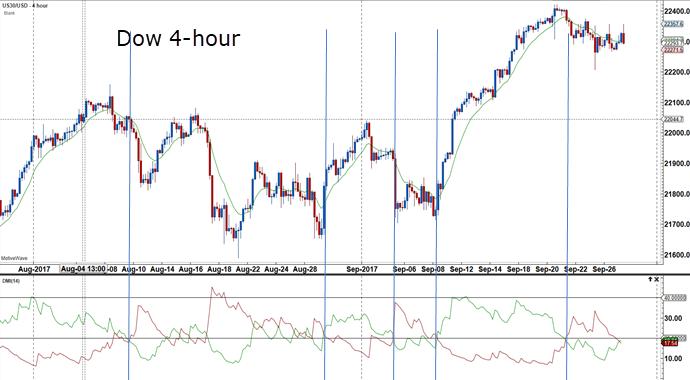 Learn how the Directional Movement Indicator helps keep traders in the trend as it is progressing. Start incorporating the DMI indicator into your chart set-up. Finally, use the DMI indicator in developing trading strategies with other indicators. This entry was posted in Trading Tips and tagged day trading, Directional Movement Indicator, forex trading, forex trading online, forex trading system, indicators, professional trader, stock market, swing trading, trading strategy, trading system.